According to the Federal Highway Administration, there are over 4 million miles of roads in the US, with 2.6 million miles paved and more than 1.3 million miles unpaved. With virtually “endless” roadways available in the country, maintenance must be conducted around the clock to ensure driver and pedestrian safety. These projects are carried out in designated, US Department of Transportation-recognized (DOT) work zones. Such locations are defined as sections of roads or highways wherein construction, repair or maintenance is conducted. Work zones are marked end-to-end using signs, cones, lights, vehicles and beacons. When roadside lighting systems are deployed in the work zone, operators are required to adhere to specific illumination standards, governed by the DOT, the National Cooperative Highway Research Program (NCHRP), the Illuminating Engineering Society (IES) and local laws (more on this later). •	Level I: 54 lux or 5 foot-candles (examples- general tasks, flagging stations and road closures). Level I is recommended for work involving low accuracy and low risk, such as tasks completed using slow-moving machines or devices. •	Level II: 108 lux or 10 foot-candles (examples- milling, paving, illumination around heavy-duty equipment and concrete work). Level II is ideal for work zone tasks that are complex and require moderate accuracy. •	Level III: 215 lux or 20 foot-candles (examples- pothole repair, patching, installation of electrical units and signs). Level III is reserved for extremely difficult, risky or hazardous tasks around the temporary site. The NCHRP recommendations above can be used as general illumination guidelines for work zones. However, as mentioned earlier, local laws (on a statewide level) should also be taken into consideration for the application of roadside lighting systems. This is because states have their own set of local DOT regulations that have been specifically tailored for the respective location. For example, the Minnesota DOT (MnDOT) handbook contains numerous requirements for addressing snowy or icy work zones. Such standards are uncommon in Nevada DOT (NDOT) documentation. •	Texas DOT (TxDOT): Requires the observation of guidelines in Transportation Code 547.105 (Maintenance and Service Equipment Lighting) and 547.305 (Restrictions on Use of Lights) for warning lights in work zones, in addition to general DOT recommendations. •	Georgia DOT: 20 foot-candles/50,000 lumens (minimum) for light towers during nighttime operations. •	Florida DOT: 5 foot-candles during general tasks and inspections in work zones. •	New Jersey DOT: 100 lux/5:1 uniformity ratio (or less) for general tasks, 200 lux for complex work (hole filling, sealing or cutting). •	Rhode Island DOT: 250-watt metal halide lamps must be used when operating rollers and pavers. Roadside work zones use heavy-duty lights for illumination during operation. For illuminating large sections of the site, light towers are typically deployed in the area. These units are designed to hold lamps in elevated positions, so that they do not get in the way of ongoing work on the ground. Moreover, with the light beam coming from an elevated source, obstruction is greatly minimized. Light mast sizes and capacities vary, depending on the size of the work zone, type of repair work and illuminative requirements of the project. The units can be mounted on trailers for seamless deployment or equipped with generators (fuel or solar), for powering portable equipment in remote work zones without access to mainstream power. An example of a light tower that is suitable for work zones is the WCDE-4-MHL from Larson Electronics. Capable of reaching 25 feet, the light mast is equipped with four, 1,000-watt metal halide lamps and a 7,500 kW generator. The entire assembly is mounted on a trailer, which comes with DOT-approved tail, side, break and directional lights. Larson Electronics also offers an LED version of the light tower. The variant, under WCDE-4-8X160WSA-LED, provides long lifespans (up to 50,000+ hours), energy efficient operation and rough handling. These units can be rented for temporary projects or fully purchased, making it a great addition to work zone lighting systems. It is best practice to ensure that lights at work zones are never pointed at traffic, pedestrians or directly in the eyes of operators. To prevent accidental blinding, work-zone luminaries are always pointed downwards. For light towers, elevated lamp heads should never be positioned greater than 30 degrees, to avoid blinding, the creation of glare or light trespass (light spillage on private property). Previously, balloon light towers were favored by work-zone operators, for their ability to illuminate the area, with minimal glare and blinding. The ball-shaped lamp head is diffused to reduce unwanted glare, while supported by a pole, which can be mounted on pavers, trucks and towers. Unfortunately, balloon lights come with numerous drawbacks and risks, when used in rough environments. For the reduction of glare, the luminary relies on fabric. This component is prone to all kinds of stress that can limit its effectiveness. Due to its weight-reducing features, the fabric can cause the balloon light to float away, when exposed to extreme winds. Hence, the fixture must be taken down during harsh weather. As a translucent material, getting mud or stains on the fabric will decrease its illuminative properties. So while the units can prevent blinding, a huge disadvantage is their limited coverage. From a cost perspective and for budget-tight projects, this is a concern, as more lights are needed to keep the work zone illuminated. A superior and more practical option is the WAL-QP-4X48.160W-LED-50 from Larson Electronics. The balloon light tower alternative uses four, high-powered LED lamps in an ‘X’ configuration for illumination. The fixtures are diffused and pointed downwards to prevent blinding. 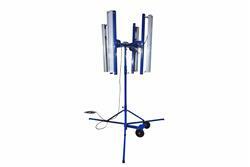 Unlike balloon light masts, the units do not require fabric during light diffusion. The LED lamps boast IP65 waterproof protection and are mounted on a quadpod for elevated positioning between 7 to 12 feet. For operators who want to use their own tower, this luminary is also offered without a supporting mast (LED light heads only) under LLP-LT-4X48.160W-LED.